About a year ago, I posted a general description of how to make your own laundry detergent that proved quite popular. That article basically described in a general sense how one could make laundry detergent at home very cheaply, but it left out a lot of key issues: does it work well? What does it look like as you are making it? What are the real-world costs and time investment? What equipment do you need? This past weekend, I made a fresh batch of homemade laundry detergent and I took a ton of notes and pictures. I enjoyed the process – I got to make a giant bucket of slime in the kitchen and my wife approved. Let’s see what we can learn from the process that might save us some cash. You’ll also need a container of some sort to store this in (I use a five gallon bucket with a lid), something to stir it (I use a large wooden spoon), another pot to boil soapy water in (I use the pot in the picture), and something to cut up the soap (I use the box grater in the picture). 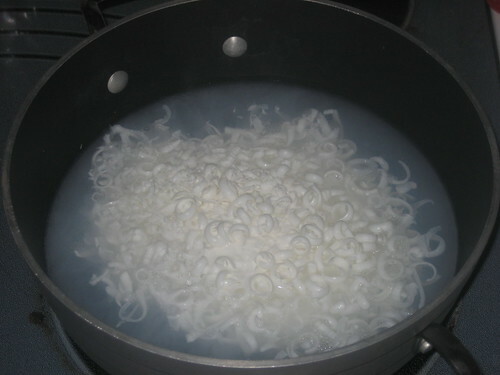 First thing, put about four cups of water into the pan and put it on the stove on high until it’s at boiling, then lower the heat until it’s simmering. While it’s heating up, take a bar of soap and cut it up into little bits. I found a lot of success using our box grater, which resulted in a ton of little soap curls. 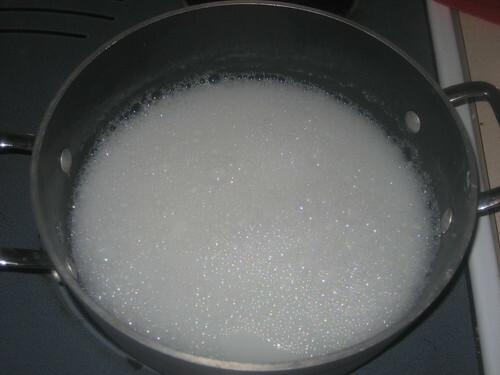 Stir the soapy water with a spoon until all of the soap is dissolved. Eventually, the water will take on the color of the soap you added, albeit paler. I used Pure & Natural soap for this, which was a white soap that looked a lot like a bar of Ivory. 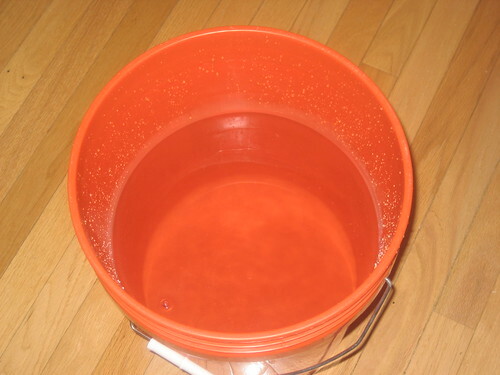 To this bucket add a cup of the washing soda and the soap solution you made and stir. The borax is optional – some people say that it’s too harsh, but I’ve always found that it did a good job getting clothes clean and fresh smelling, so I recommend adding a half cup of borax to the mix. Don’t worry if your batch doesn’t match the color of my own – it varies depending on what kind of soap you use. I made a batch with Lever 2000 in the past and it had a greenish tint to it, and I’ve heard reports of all kinds of different colors from other people who have tried this. At this point, let the soap sit for 24 hours, preferably with a lid on it. I just took our bucket to the laundry room. When you take off the lid, you’ll find any number of things, depending on the type of soap you used and the water you used. It might be firm, like Jello; it might be very watery; it might even be like liquid laundry detergent. Just stir it up a bit and it’s ready to be used. My batch wound up being rather slimy. It had some slimy-feeling water with various sized pieces of white gelatinous stuff floating in it. Here’s what it looked like – I’m using a video here because images don’t really capture it. Don’t worry about the texture – it’s completely fine. Just use a measuring cup and use one cup of the detergent per load of laundry. If it’s got “globs” in it, get a mix of the water and of the globs – it’ll break up very quickly in the washing machine and wash your clothes well. If you’re still concerned, you can mash up the globs quite easily, but I saw no reason to do so. Naturally, I wanted to test this detergent out. I tried to think of a good way to do something foul to a shirt, but something realistic – something I might do as a rather normal Midwestern guy that might also occur to any other guy in America. The answer hit me quickly. The above t-shirt is the one I washed with Tide with Bleach Alternative, which is the laundry detergent we’ve used by default when we don’t have any homemade detergent on hand. It’s the one most highly recommended by Consumer Reports and this is the perfect opportunity to show what it can do. 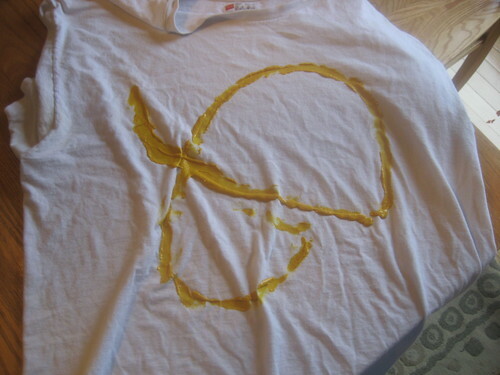 After I took the picture, I smeared the mustard into the shirt a little. The above t-shirt is the one I washed with my homemade detergent. My mustard container ran out near the end here so the trail of mustard isn’t as long. I had already smeared in the mustard when I took this picture. 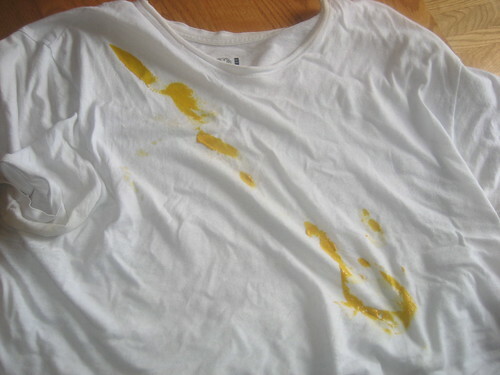 Also note, although the pictures don’t clearly reflect it, the one smeared with homemade detergent was somewhat dingier right off the bat – it’s an older shirt, I believe. Down in the laundry room, I pre-treated each stain by taking a small amount of each detergent and rubbing it into the stain with a brush. Then, I washed each shirt in a normal load – one load with Tide with Bleach Alternative and one with my homemade detergent. With the homemade detergent, you can still make out parts of the mustard streak, but other parts appear to be completely gone. With a proper pre-treatment or a washing in bleach, this shirt would be as good as new. With Tide with Bleach Alternative, the same exact story is true. You can still make out where the stain was if you look close, but it’s almost completely gone. A proper treatment would have resulted in no stain at all. They’re pretty close. 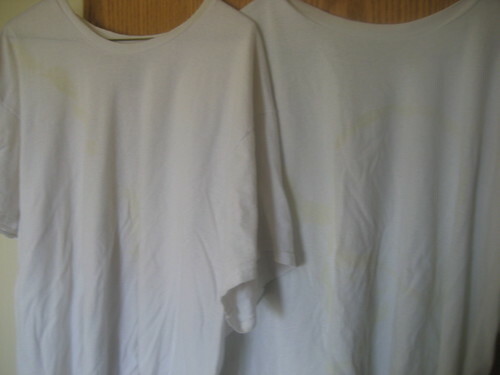 They’re both obviously very clean white tee shirts with a slightly noticeable mustard stain. At different points in each mustard streak, the streak appears completely gone – at other places, it’s fairly noticeable. That’s likely due more to my pre-treatment application than anything else. Frankly, I couldn’t tell a difference between the two. 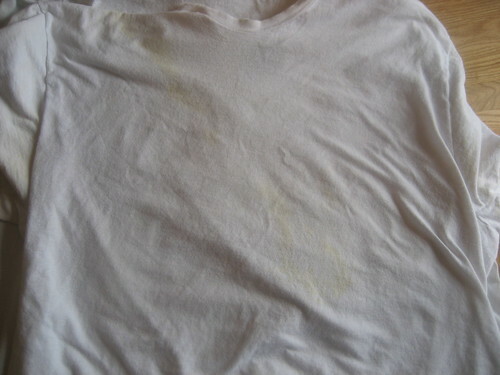 Both detergents produced a clean-smelling shirt. 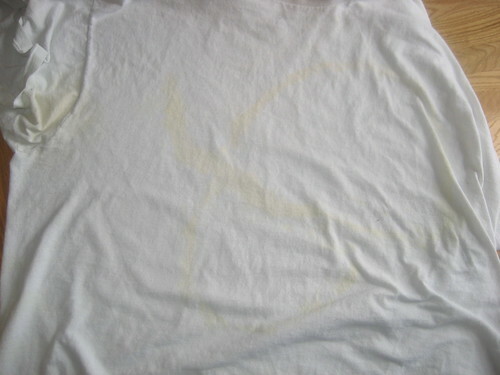 Both produced a very white shirt with just a slight remnant of a mustard stain – a remnant that was almost identical in the two shirts. In a nutshell, I believe my homemade detergent cleans comparably to Tide with Bleach Alternative. 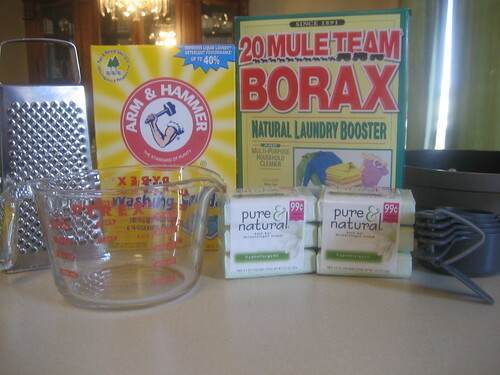 The box of Borax, which contains enough Borax for at least twelve batches of detergent, cost $2.89. The box of washing soda, which contains enough soda for six batches of detergent, cost $1.89. The soap, which came in packs of three (as pictured above), cost $0.89 per pack – I bought two, to ensure I had enough for six batches. 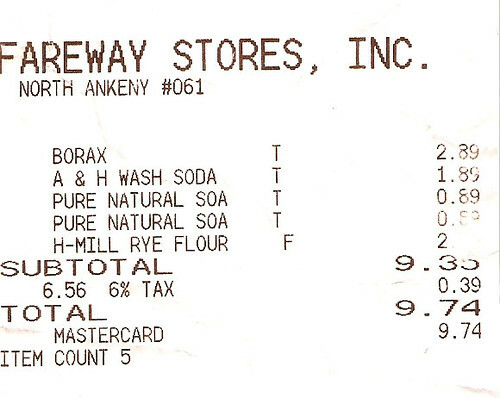 The Iowa sales tax on this stuff was $0.39, giving me a total bill of $6.95 for the ingredients – enough for six batches. I also used perhaps a penny’s worth of water and a penny’s worth of heat to heat it – a total cost of $6.97. 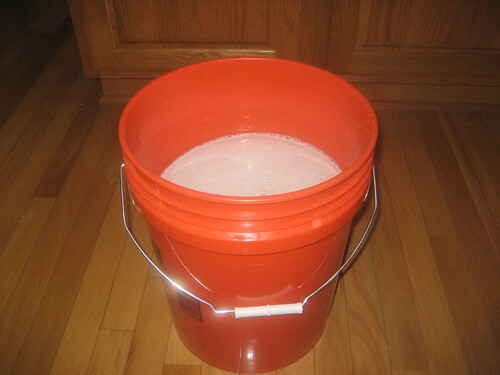 Each batch of detergent contains 52 cups of the solution – 48 from the three gallons in the bucket, and four more cups of water with the dissolved soap. Since I use one cup per load, this means a single batch makes 52 loads’ worth of detergent. Let’s say, hypothetically, that I make six batches of the stuff and use the other half of the box of Borax for something else. That means I’ve made enough detergent for 312 loads of laundry for a total cost of $6.97. That’s roughly two and a quarter cents per load of laundry. Let’s look up Tide with Bleach Alternative, the Consumer Reports recommended detergent. You can buy four bottles of the 150 ounce Tide with Bleach Alternative from Amazon for $62.60. We’ll assume free shipping and no taxes here to help Tide’s case out. Each of those Tide bottles has enough detergent for 78 loads of laundry, meaning the case will cover 312 loads of laundry. Thus, each load of laundry using Tide with Bleach Alternative costs almost exactly $0.20 for detergent costs. In other words, nine loads using my homemade detergent has the same detergent cost as one load of Tide with Bleach Alternative. To put it in another perspective, let’s say I do one load of laundry a day for a year using each detergent. Using my homemade stuff, I spend $8.15 for the detergent over the course of the year. Using Tide with Bleach Alternative, I spend $73.23 over the course of a year. Using my homemade detergent instead saves me $65.08 a year. Plus, it was fun to make. Given that the detergent seems to do roughly as well as our regular name-brand detergent and is ridiculously cheaper, I plan on using my homemade detergent for the foreseeable future. I make no claims or guarantees as to the effect the detergent will have long term on your clothes – frankly, I don’t know. But I do know it cleans well – it passes muster for me and seems to handle difficult stains roughly as well as Tide with Bleach Alternative – and I do know I plan on using it for a long while. It’s hard to say no to that kind of savings.